TextConverter properties and methods include some very useful functions that are implemented by the TextConverter object. Using these methods you can access different TextConverter objects and their data or modify TextConverter's default behavior. The TextConverter object is accessible by the "this" name, but the "this." word could be omitted. All TextConverter object's top level properties and methods accessible just by their names. Hint: In the script editor start typing "this." (note the dot "." after the word "this") and then choose a desired method from the list. 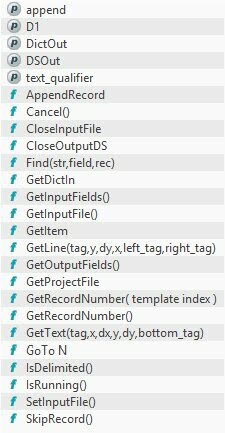 this.GetName - This will get the name of a field. this.GetText - Retrieves text from input based on various parameters.